Zeb Realty only associate with the best..
At ZEB realty, we only work with like minded professionals who deliver the same exceptional level of service that we pride ourselves upon. Ann & Stuart proudly have on display, a stunning RobynGraph by Robyn Hills, one of Australia’s highest awarded photographers – of course featuring their love of everything ZEB. Robyn has just received her fourth ‘Master of Photography’ accreditation and at the recent judging of the Australian Professional Photography Awards received two Silver With Distinctions for her portraiture. This is in addition to her already being bestowed with the highest honour the AIPP can give – that of ‘Fellow of the Australian Institute of Professional Photography’ and also having previously won the title of ‘Australian Professional Photographer of the Year’. Be sure to mention ZEB realty when you get in touch! For help with your home loan and to achieve your property dreams SMS Finance in Maroochydore is your local specialist on the Sunshine Coast. Speak to Colin Mason, your Finance specialist and mention ZEB realty! Colin is a Director and offers his clients extensive knowledge of the financial services industry having held management roles in major banking and insurance corporations. Colin is highly energetic and passionate about building long and lasting relationships with the local Sunshine Coast community. He holds a Diploma in Financial Planning and Certificate in Financial Services. Stu Garnett provides a professional real estate photography service that captures the essence of lifestyle in your property. Stu is willing to go to any length to capture the perfect shot! He is also a brilliant lifestyle photographer, recently shooting Ann & Stuart’s Wedding at the beautiful Maleny Botanic Gardens. BEST printer on the Sunshine Coast without a doubt! Jeff and the team are to put it simply – awesome to work with! Floor Plans give context to photos and descriptions, at the same time conveying a properties potential. By engaging buyers and pre-qualifying, floor plans save you time and help you sell faster. Fast becoming an essential part of property marketing, floor plans add to your quality property presentation, attracting buyers to your property. Used exclusively by ZEB! Jo is a Specialist property copywriter, who writes internet and advertising copy for Real Estate professionals all around Australia. ZEB is proud to have her exclusively write all of our copy. Narrows Escape is nestled amongst the treetops in Montville, the cultural heart of the Sunshine Coast Hinterland. Six delightful pavilions dot the property with just trees and earth as your closest neighbours. Invigorate your senses with a peaceful escape where relaxation is the only item on your agenda. Owned by Joanne & Mark Skinner, highly acclaimed operators within Tourism QLD and Australia. Ann & Stuart highly recommend escaping to Narrows, whether it be for a romantic getaway or somewhere to stay for a few days whilst looking for property on the Sunshine Coast. At Sunday Brides your dreams are our dreams, your joy is our joy and your cherished wedding day memories also become our cherished memories. Ann gave Lee-anne full license in designing her Wedding Dress with the only instruction being bohemian and a little bit of orange. The result, as you can see below is just outstanding! One very happy Bride. Their is focused on providing personalized service and one of a kind Custom Designed Bridal Wear for the whole bridal party. By designing, tailoring and creating each Wedding Dress individually for every bride they are able to make your dream dress become a reality! The lovely Ruth is a fun, vibrant and effervescent lady who went above and beyond to ensure our elopement was nothing short of perfect! We recommend her to anyone who is considering getting married on the Sunshine Coast Hinterland or Beaches. Unique floral designs reflecting your personality and style are created from the magnificent perfumed blooms from our very own garden when available. From bridal party bouquets to ceremony and reception flowers, From The Garden Bouquets delivers anywhere from the scenic Mary Valley, throughout the glorious Sunshine Coast and Hinterland down to Brisbane. Ann’s flowers featured heavily perfumed roses and beautiful orange orchids. Nellie went out of her way to ensure even the petals in the cones were fragrant! Beautiful shades of orange, all from Nellie’s own gardens in Imbil. Maleny Botanic Gardens currently cover 14 acres and are always expanding. 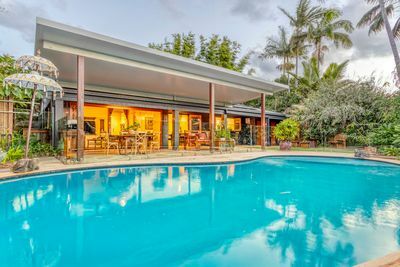 Situated on one hundred and ten acres, they are surrounded by magnificent rainforest with spectacular views of the Glasshouse Mountains. It also has an Aviary covering over 1000 sq m and walk through tours are available. The Aviary is home to a wide variety of birds from Macaws to finches. Enjoy the waterfall, nests and your shoulders to rest on when you visit. Ann & Stewart were married here with the Glasshouse Mountains as the backdrop, and were the first Bridal couple brave enough to enter the Aviary for photos! Tina Cooper has opened her own prestigious Art Gallery in the quaint Sunshine Coast hinterland township of Eumundi, Queensland, Australia. It features a diverse range of artwork created by leading artists from South East Queensland together with her own unique creations. Tina recently celebrated her 25 years in Glass Exhibition! Ann and Stuart were there to celebrate with Tina’s milestone. A favoured watering hole for the team at Zeb is Elements at Montville it is a destination not to miss and a big favourite of all locals. 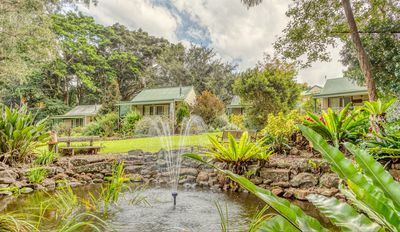 Nestled in the Sunshine Coast hinterland our tearoom & café, interiors and gift store overlook the beautiful Kondalilla Falls valley and is just the perfect location to relax, sit alone, or share with others. Sweeten the soul, nourish the mind, delight the senses. Sarah and the team will show you the hospitality of the Hinterland. Ann’s favourite delight is their flourless chocolate & rhubarb cake accompanied by a nice cold jar of mineral water!